So today I decided to pull out the old camera from my car, and hopefully use the mount and whatever else, for the new system. 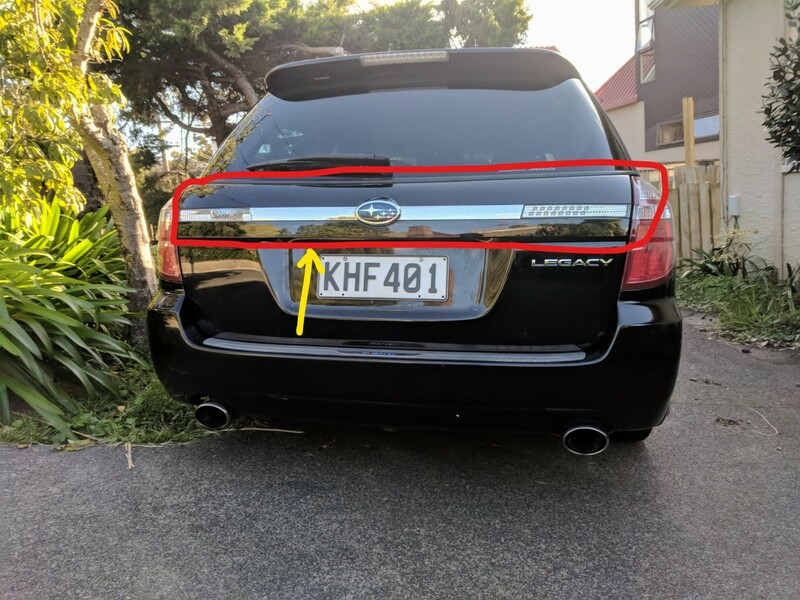 My 2006 Subaru Legacy had a reversing camera. I have ripped out the old screen system (was in Japanese) and have replaced it with a DIY Android system. 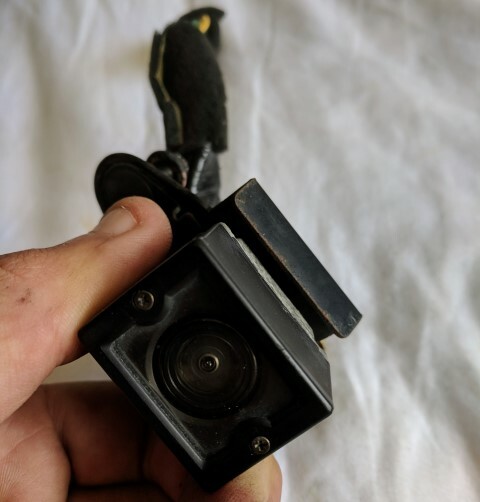 As a consequence, I lost my reversing camera, which used to feed an analogue video signal into the back of the old screen unit. I played around with using USB webcams plugging into the raspberry pi running (Android) Emteria OS that is the backbone of my new system. This was just a bit clunky though – Android just doesn’t ‘do’ usb camera too well. I also read somewhere that the raspberry pi’s performance is stunted by USB webcams. I ordered a couple of cheapo fisheye ‘night-vision’ Rasbpi cameras off AliExpress and an HDMI converter from Petite Studio. They work great with the system: as far as Emteria OS is concerned its the ‘in-built’ device hardware camera. 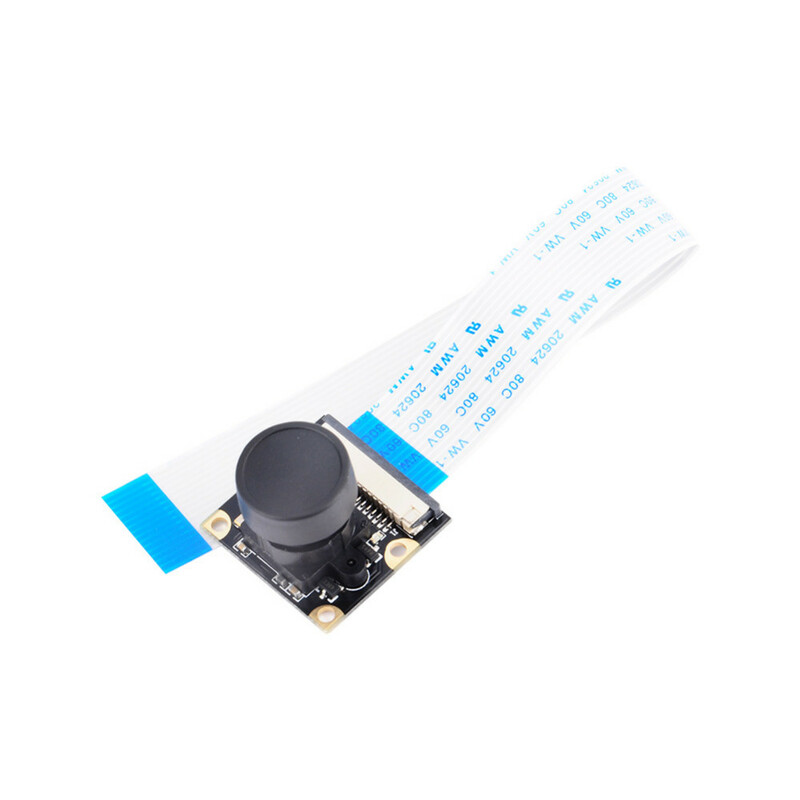 Camera from AliExpress. Actually okay. Says you need to use infrared light to get any night-vision. Maybe. This was pretty easy. The guy in the video below does it quite heavy handily. This is great (not so great for him) because his breaking, dropping and snapping bits means I didn’t. Pulling off the internal trim does not give you access to the camera cleanly, but gives you access to all the nuts to pull off the external plastic body-coloured bit below the rear window. Yunno, you’d never know this strip wasn’t metal & part of the bodywork – it sits over & shrouds the camera but also houses the reversing lights, manual latch for the door and lights for your plates. Once this bit is off (or loosened, does not need to come right off) pulling out the camera unit is easy. The red bit…. it’s just plastic [jaw drops in surprise] you can take it off by undoing quite-a-few nuts from the back. Camera is concealed where the yellow arrow is. The plastic trim is fixed on with 12 nuts (maybe 10! See point 2). 2 down each side( which you need to pop off the little black plastic side bit to expose) and the reaming 8 spread more or less evenly across the width of the door. 6 of these 8 nuts are 8mm nuts and two closely positioned ones in the middle are 10mm. I am not 100% sure the two 10mm ones need to come off…they might be holding on something else(?!?!). Dunno, just seems weird they were a different size and so closely placed. Finding all 8 nuts is a bit of a hunt, and you need long sockets to access them. Once all the nuts are removed the plastic trim lift off reasonably easily. The camera unit was mounted under this with 2# 8mm nuts, and plugged into a brownish cable. The cable and plug type are the same as the one that went into the screen system down the front of the car…which was reassuring. Putting in the new HDMI cable hopefully will be like me being Theseus following the string through the labyrinth that is the car’s wiring network. 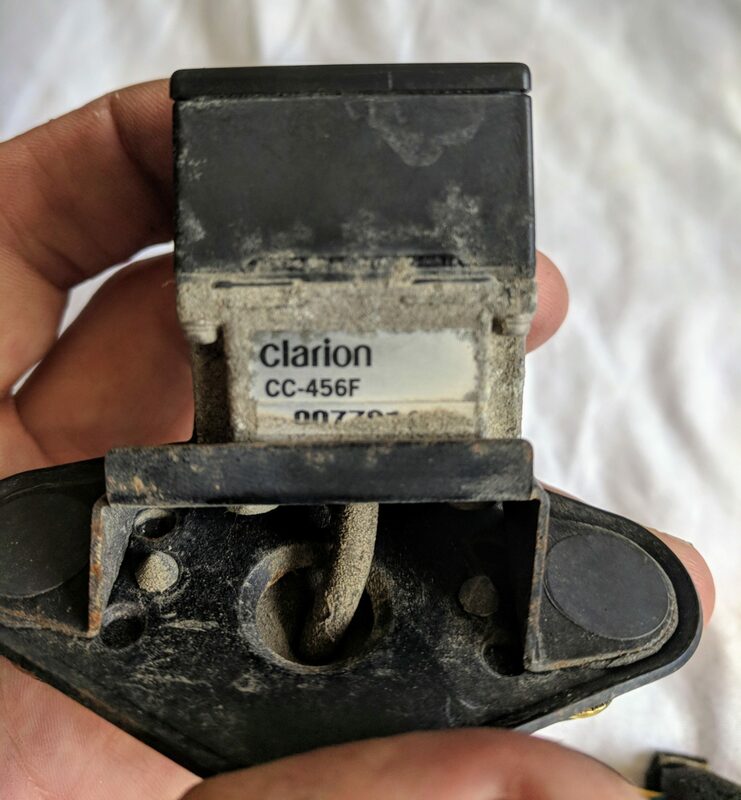 It a pretty compact unit, labelled as a Clarion CC-456F. 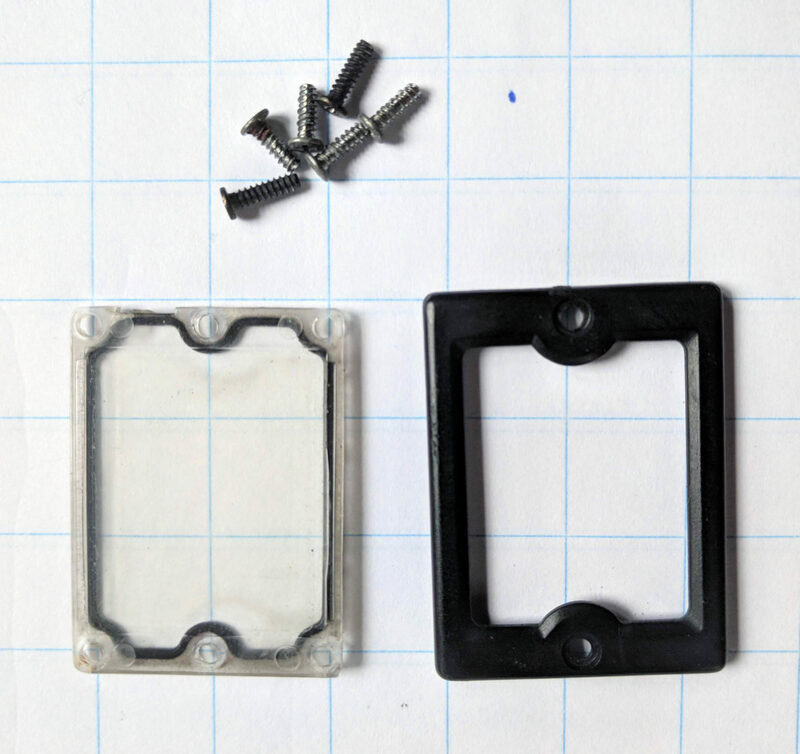 It has a rubber-gasketed transparent protection pressure cover, which I may reuse, and a steel mount, which I will definitely reuse. I plan to swap out the old camera unit itself for a 3d printed unit with my cheap pi camera mounted inside. Bend steel mount at back of unit. Angled (in two plane) and offset I suppose to align the camera view – since the camera is not mounted on the centre axis of the car. I shall reuse this – it’ll save me having to set the camera view manually. The lens protection fro old camera. Bit yellowed – though initially from UV, but pretty protected from sunlight so maybe from exhaust?!? If I can clean it up a bit might try and reuse – the cameras I bought CLAIM to be waterproof…ya…I don’t think so.